SOLIDWORKS components are instances of models (parts or assemblies) in the another parent assembly. 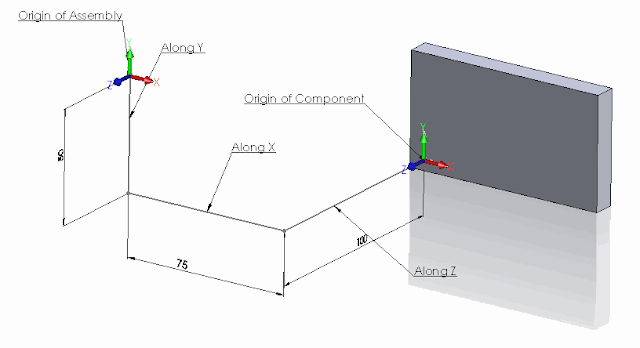 Component’s position in its space is driven by its transformation (regardless if the component is constrained by mates or moved in the space by free drag-n-drop operation). Transformation consists of 3 components: translation, rotation and scale. To get the transformation of the component use the IComponent2::Transform2 SOLIDWORKS API property. The transform in this case represents the relation of the component origin coordinate systems to the root assembly origin coordinate system. It is not required to multiple the transform of sub-assemblies for its children components to get the total transformation of these components relative to root assembly. Debug.Print "Along X: " & vCompOriginPt(0) * 1000 & "mm; " & "Along Y: " & vCompOriginPt(1) * 1000 & "mm; " & "Along Z: " & vCompOriginPt(2) * 1000 & "mm"
Now let’s rotate the component and try to find the rotation angles. This component is rotated in all directions. Red line below - is the X axis of the assembly, Green line - Y axis, Blue line - Z axis. 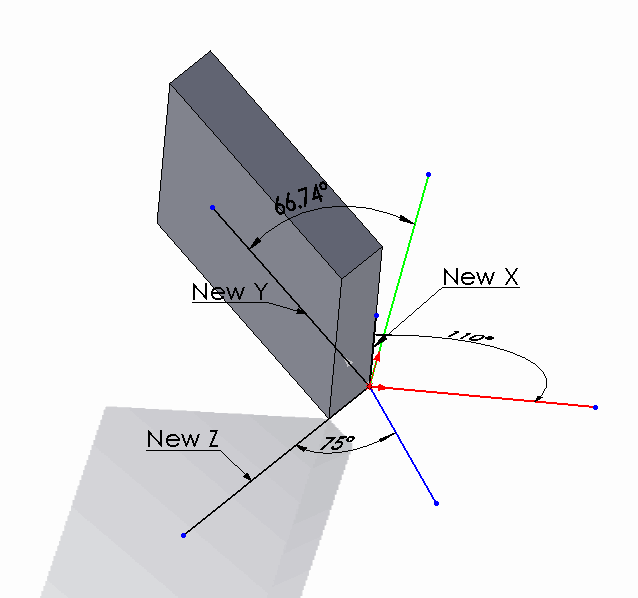 New X, New Y and New Z - are orientation of the corresponding axes in the component and dimensions indicate the angles between those axes. Debug.Print "Angle between X axes: " & Round(GetAngle(1, 0, 0, swTransform) * 180 / PI, 2) & " deg"
Debug.Print "Angle between Y axes: " & Round(GetAngle(0, 1, 0, swTransform) * 180 / PI, 2) & " deg"
Debug.Print "Angle between Z axes: " & Round(GetAngle(0, 0, 1, swTransform) * 180 / PI, 2) & " deg"